Fund My Mutual Fund: Dollar vs Gold - Can we Trust this Change? Dollar vs Gold - Can we Trust this Change? We've been watching the dollar vs gold very carefully and the action the past few days has been interesting to say the least. The action today, if you trust the charts, could be signaling a complete change in character. We've been saying all this printing of paper will be a disaster for the dollar (eventually), and a boon to gold (in theory)... other commodities as well (theoretically). This is the "reinflation" trade. What has been perplexing people is the strength in the dollar since late summer, despite the U.S. being the nexis of the world's problems. In any other country where a financial crisis is born, the currency would be abandonded. Overlay with this with the interest rate cuts - which should be yet another knife in the back of the dollar - all things being equal, capital should flow where it is treated better (higher rates), not treated the worst. This is what the textbook says - however reality has given us the exact opposite. The dollar has rallied for months on end. Why? The theories have been, as bad as the US situation is, the rest of the world is even more scarier. Personally I disagree with that - I think that is thinking born over 30,40,50 years. If you look at the "balance sheet" of the US, plus the coming entitlements in the coming decades [Mar 26: Annual Spring Entitlement Warning Falls on Deaf Ears] , plus the bailout bonanza - we are heading for bankruptcy/default [Nov 12: CNBC Europe: USA May Lose its AAA Rating] OR a printing spree of dollars that is going to make what is currently going on look like a tea party. How the U.S. is "safe" versus an Australia, Canada, Switzerland is beyond me - Germany, despite a similar recession as the US in exports, does not have a country built on a housing bubble, credit bubble, and over consumption bubble - why is the US "safer" than Germany? (unfortunately there is no independent currency there anymore) But it takes a long time for people to break historic concepts and "the US is the safe haven" has been burnt into people's minds for decades - I think as we suffer the consequences of our "kick the can down the road" and "only deal with the fire on the couch we currently sit on" actions this shall change in the coming decades. But this is all theory... the dollar SHOULD be faltering.... but everything is technical in nature and chart driven. A trend stays a trend until it no longer does. At *some* point these trends that have played out for months should reverse and the dollar should begin to weaken, and gold strengthen. So that's the difference between "theory" and "seeing it really happen". What has been playing out the past few days has shown this reversal and today key technical measures on the (long) dollar ETF were taken out. Can we trust it? Hard to tell, as nothing in this market seems trustworthy but this could be inning 1 of a long term reversal. 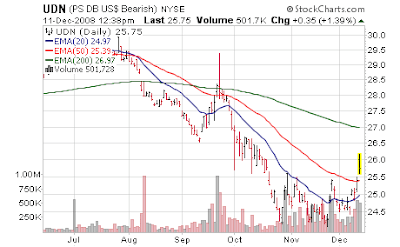 This is the the bullish dollar ETF - Powershares DB US Dollar Bullish ETF (UUP) - it broke its 50 day moving average today for the first time (other than a few days) since July 2008. One could say a beautiful double top (bearish) just over $27. 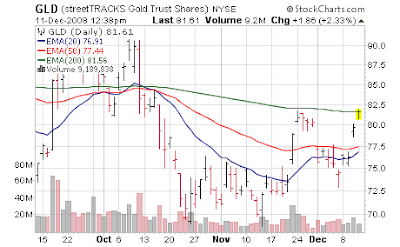 In theory the gold ETF - GLD should trade in inverse. 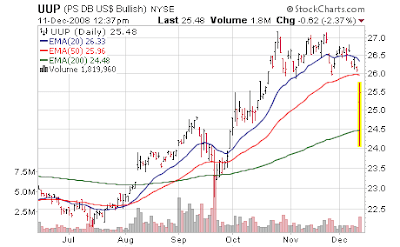 We now have reached the same spot we reached two weeks ago which is either going to form a double top (bearish) in gold (where we stand at this moment) or once we clear above that 200 day moving average the potential beginning of a new bull market. I would say a move over $83 in GLD signals we could have the "change" here. And the inverse of the bullish dollar ETF (of course) is now breaking out to the upside - Powershares DB US Dollar Bearish ETF (UDN) - you can quite obviously see the change in character. 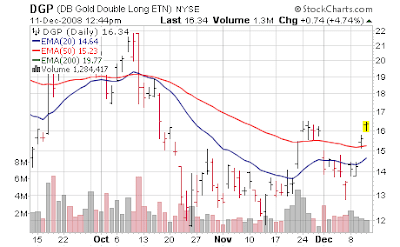 If this is step one of a "real" move and not just a quant hedge fund headfake, two ways to play are the dollar bearish ETF and Double Long Gold ETN (DGP) - also sitting there with a double top (potentially) - this is just double the gold chart above so they will move in concert but this one with double the velocity.